Today local Tibet Travel Expert Service team introduces some traditional Tibetan food. As the roof of the world, Tibet is famous for intoxicating scenery, numerous religious sites, broad and profound culture, ancient history as well as the Traditional Tibetan Food. The staple food of Tibetan people is Zanba, a kind of dough made with roasted highland barley flour and yak butter with water. The process to make Zanba: Firstly grind the roasted Highland Barley into flour, and mix it with ghee. 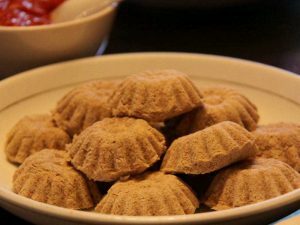 It is similar to parching wheat flour in northern China. People in northern China grind the wheat into flour before parching it, but Tibetan people do the opposite. They roast the Barley seeds before grinding them into flour. What’s more, Tibetan people do not remove the husk of the Barley. 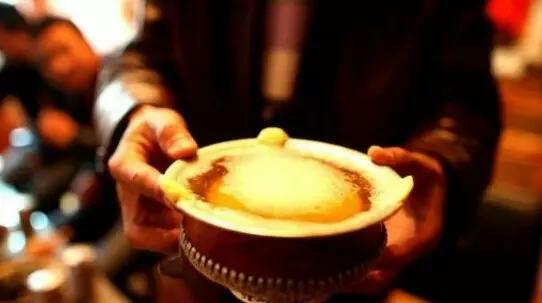 When eating Zanba, Tibetan people put some ghee in a bowl, pour some boiled water into the bowl, then put some roasted flour into the water, and mix them with right hand. When mixing the tea, they press the flour slightly against the edge of the bowl with their fingers to avoid spilling the tea. After mixing all the roasted flour, the tea and the ghee until the thing gets thick, people knead it into dough balls and eat them. Tibetan people use hands or spoons instead of chopsticks when eating. Zanba is a simple but nutritious food. It is quite easy to take some Zanba when Tibetan people move about in search of pasture. When Tibetan people leave home for a long time, they always carry a bag of Zanba on their waists. Whenever they are hungry, they eat some Zanba. Sometimes, they take out a wood bowl, put some Zanba, buttered tea, and salt in the bowl. Then they knead the dough into balls and eat them. It’s very convenient. Sometimes, they drink some buttered tea while eating Zanba. Sometimes, they pour Zamba and buttered tea into a leather bag named “tangu”. Then, they hold the mouth of the bag with one hand and knead the bag with the other hand. After a while, the delicious Zanba dinner is ready. During the Tibetan New Year Festival, every family will place an auspicious wood container called “Zusuqima”on the Tibetan-style cupboard. In the container is Barley (called qingke in Chinese), Zanba and zholma (groma food, a kind of Tibetan food), on top of which are ears of qingke wheat, wheat flowers and colored cards on which the sun, the moon and stars are drawn. When the neighbors or the relatives come to pay a New Year call, the hosts will entertain them with the food in “zhusiqima”. The guest will take some Zanba with one hand and flick in the air for three times. Then he takes some Zanba and put it in the mouth while saying “Tashi Delek” (meaning good luck and happiness) to express the best wishes for the new year. 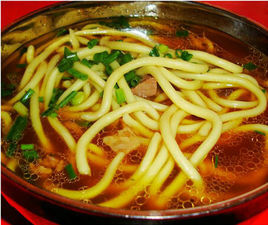 As a typical snakes is in Tibet, Tibetan noodle is also one of the most pupular foods in Tibet. It is favored by local people and travelers. Yak Butter Tea (which is called Su You Cha in Chinese) is the favorite drink of Tibetan people and people drink it everyday. Tea plays an important role in Tibetan people’s daily life. Yak Butter Tea is made of boiled brick tea and ghee. Ghee looks like butter. It is a kind of dairy product of fat abstracted from cow milk or sheep milk. Tibetan people like the yak milk which is called ghee. Tibetans use unique wooden bowls instead of cups for Yak butter tea. In a family, each person has his or her own bowel. And men’s bowls are always bigger than their wives. 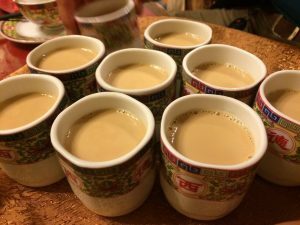 When visitors come to a Tibetan family, the host will present them with tea and then they will sit down and begin to chat. The host will refill their guests’ bowls continuously. But if a guest stops drinking and allows it to get cold, the host will dump it out and refill it with fresh one. Drinking and presenting Tibetan tea has become an integral part of every Tibetan’s life. According to the local customs, when a Tibetan woman gives birth, her relatives will visit with tea on the second day if the woman has a son but on the fourth day if she has a daughter. Read more about Tibetan tea. Barely wine also name “qiang” in Tibetan language. Along with Tsamba and Butter Tea, Barely Wine is another staple food in Tibet. For most of the newcomers to Tibet, they are fond of drinking sweet tea. Especially the sweet tea in Lhasa is very famous. When you are tired after one-day tour in Lhasa, you can enjoy this kind of delicious drink in the tee house with a low price. 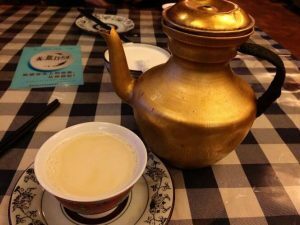 Many travelers think it is more delicious than butter tea. This kind of food is much delicious and easy to carry. 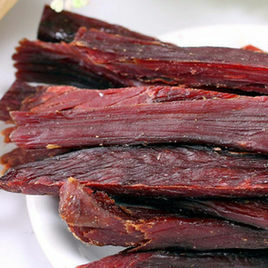 It is the best time for Tibetans to make dried beef when the temperature drops under zero. The local people cut beef into clumps and then, hung the beef with strings. After a period of time, beef dried naturally. For some travelers who like this kind of food will buy some as gifts for family and friends when leaving Tibet. Besides, there are some other kinds of traditional Tibetan foods. If you are a food lover, Tibet is a perfect destination you cannot miss! So plan your Tibet Travel with local Tibet Travel Agency now! For more Tibet tour information, you can follow our Tibet Travel Blog.